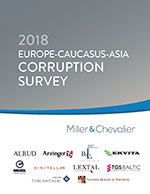 Washington, DC, September 4, 2018 – Nearly three-quarters (71 percent) of respondents working in the Europe-Caucasus-Asia (ECA) region don't believe in the effectiveness of their country's anti-corruption laws, according to a new survey released by Miller & Chevalier Chartered. Some of the most significant findings of the inaugural 2018 ECA Corruption Survey reflect respondents' lack of confidence in their governments' oversight, enforcement, and prosecution of corporate malfeasance. But the responses paint a divergent corruption picture across the ECA countries surveyed, which include Azerbaijan, Belarus, Estonia, Georgia, Kazakhstan, Latvia, Lithuania, Moldova, Russia, and Ukraine. "This report seeks to provide deeper insights into the sources and prevalence of corruption, to inform companies' approach to compliance, and to provide incisive country-by-country analysis," said Ann Sultan, Counsel at Miller & Chevalier. "The research is similar to what we've conducted for over a decade in Latin America, and we felt it was an opportune time to assess how corruption is impacting the business sphere in this part of the world." Almost two-thirds (62 percent) of respondents say corruption is a significant obstacle for companies doing business in their country. That appears to be more than just perception, as 36 percent report that they or someone they know has been approached with a request to bribe a government official. Furthermore, over a third (35 percent) say they recently lost business to a competitor that provided improper benefits to a government official. "The survey results demonstrate that corruption risks are part of the cost of doing business for many companies across the region," said Michael Skopets,* Senior Associate at Miller & Chevalier. "We received encouraging feedback from many respondents who are taking affirmative steps to improve their risk mitigation and compliance strategies, even as the responses reflect areas for additional compliance improvements." "Half of the respondents say the importance of preventing corruption has increased in their companies in the past five years, and we expect that figure to grow over time, given the increasingly international nature of anti-corruption enforcement," said Maryna Kavaleuskaya, Associate at Miller & Chevalier. "We look forward to tracking these actions and sentiments in the coming years." "The extent and type of corruption varies across the region," said James Tillen, Vice Chair of the firm's International Department. "The survey responses have been instructive to consider how companies can tailor their compliance programs to address the unique risk profile of each country." In May and June 2018, Miller & Chevalier and 10 partner firms in the ECA region surveyed business executives, in-house legal and compliance personnel, and other professionals working in a broad cross-section of industries. In total, 313 individuals with first-hand work experience in the region completed the survey, which was available in English and Russian. Respondents for Estonia, Georgia, and Lithuania indicate the least personal experience with and direct business impact from corruption. At the other end of the spectrum, 58 percent of respondents for Kazakhstan and 72 percent of respondents for Ukraine say they have been approached or know someone who has been approached with a request to bribe to a government official, and 67 percent and 52 percent, respectively, say their companies likely lost business during the previous year because a competitor paid a bribe. Estonia, Georgia, and Lithuania also report the least corruption across government institutions, whereas Azerbaijan, Kazakhstan, Russia, and Ukraine indicate significant corruption across most of the government functions surveyed. Startlingly, at least 50 percent of respondents for every country say that their courts and the prosecution services are moderately or significantly corrupt, with Estonia (21 percent) as the only outlier. The most common anti-corruption compliance practice of companies working in the region, according to responses, is the implementation of a corporate anti-corruption policy (63 percent). Fewer respondents report their companies having more specific policies or procedures, such as those for business courtesies and hospitality expenditures (44 percent); for charitable and community donations (38 percent); and for political contributions (23 percent). Regarding steps that might reduce corruption in respondents' respective countries, two of the three most common answers focus on criminal justice reforms. This view was especially pronounced in Ukraine and Russia, where 92 percent and 84 percent, respectively, of respondents believe that an independent and impartial judiciary is key to reducing corruption.